A movie always has some sort of message. Cartoons, as simple as they may seem, are no exceptions. After all, every product of human creativity must be inspired by a real-life situation. If you are keen, you can spot it in every movie you watch. Russian cartoons, especially made in the Soviet era, are quietly reflecting the past life in USSR. In the era where freedom of speech and freedom of expression are limited, cartoons were the platform to express an idea in a subtle way. It also brings back a childhood memory. Here is some title as an example. Father Frost is what Santa Claus is in Russia. Since Christmas is not celebrated during the Soviet era, Father frost visits children in the new year instead. In this story, Father frost comes in summer, and he’s melting! Thankfully there are several good children who help him out. Hedgehog in the Fog is more than a story about a cute hedgehog who gets lost in the fog. This award-winning cartoon tells something else. The anxiety and terror the little animal experienced is said to reflect the general feeling of Soviet society at the time. Continuation from 1978’s Three from Prostokvashino. 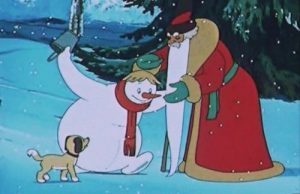 The three friends, Cat Matroskin, dog Sharik and uncle Feodor go to the village Prostokvashino. They want to have a summer vacation. Want to know how it’s like in countryside Russia in 1980? This cartoon can be a fun source of information. A metaphor and a satire of bureaucrats life in that era. This cartoon is minimalistic and a timeless classic. Created by Fyodor Khitruk, it’s a socially aware animation that reflects the social setting of USSR. The little locomotive carries his daily work happily. He takes passengers through the countryside and informs the viewer about each place he happens to pass. If you’re familiar with the American Thomas the Train, then this is the Russian counterpart. A boy, which later called Uncle Feodor, found a cat and wants to keep it. Since his parents won’t allow him, he took desperate measure: He ran away from home. Later the two of them, the boy and the cat, meet a dog named Sharik. And thus began their adventure. This is the first film of the Prostokvashino trilogy. Another parody, another social satire. Now this one reflects the filmmaking process during the Soviet era. The creator is Fyodor Khitruk who also made Man in The Frame. In this almost silent movie, you can watch how hard it is to produce a single movie in the USSR. The logistic aside, the movie in the cartoon is said to be rejected by the authorities because its ending deemed “too gloomy”. It’s a story about an island child Petja who one day encounter a Soviet submarine in the southern sea and went to an adventure with it. If there’s anything more Russian than an appearance of Russian warfare in a cartoon set somewhere in the tropic, we don’t know what is. We have other interesting cartoons you can check. They are not necessarily reflecting Russia but nonetheless a fun movie to watch. If you’re interested in Netflix Russian cartoons, you can read this list. As well as Russian cartoons which go popular at a global level. People fear that robots will take over humanity goes as far as decades ago. This cartoon is set is totally no so distant future 2026. The bad guys are the robots who run the world now. They want to eradicate humanity and the so-called invaders. This sci-fi animated movie is a fresh break from your typical cartoons. What happens when a lion who daily work at the circus goes on holiday in his home continent of Africa? He simply wanted to fish and just relax. But somehow he found himself entertaining a bunch of local kids with his circus tricks. He had to say goodbye to a quiet holiday. The Winnie the Pooh of Russia. Also based on Christopher robin’s book, this cartoon tells the adventure of a cub bear and his animal friends. Now this one is based on Kipling’s children story “The Jungle Book”. Set in India, it’s a story if mongoose who has been a guard of a British family garden. His duty is to avoid an invasion of two cobras who live nearby. This cartoon tells his bravery protecting the family from the snakes’ wrath. The adaptation of Pinnochio and The Golden Key by Alexei Tolstoy. The cartoon follows a puppet boy made of wood as he sets into adventure saving children from a theater. Ironically enough the cartoon is about what will happen should a child disobeying adults. It’s a heartwarming a story about a crocodile who’s lonely and in need of some friends. He works at a zoo every day but has no friends to play with in the evening. He sets up an advertisement and many people, human and animal, are responding. If only that works in real life. The cartoon is about two feuding animals, a wolf, and a hare. Just like Tom and Jerry, the wolf will go at nothing until he can catch the hare. It’s a classic which frequented Russian TV in the past and until today. Both characters are loved cartoon characters.